The Crop Scouting package, which includes DJI’s Phantom 4 Pro coupled with PrecisionHawk’s flight and analytics software, is geared towards growers who want to implement drone technology to improve production efficiency across their precision farming operations. The package is available for pre-order today. Following the success of the Smarter Farming Package, launched in May, PrecisionHawk is making it easier for growers to adopt drone technology and prove the return on investment by launching an easy to use and low cost smarter farming kit. 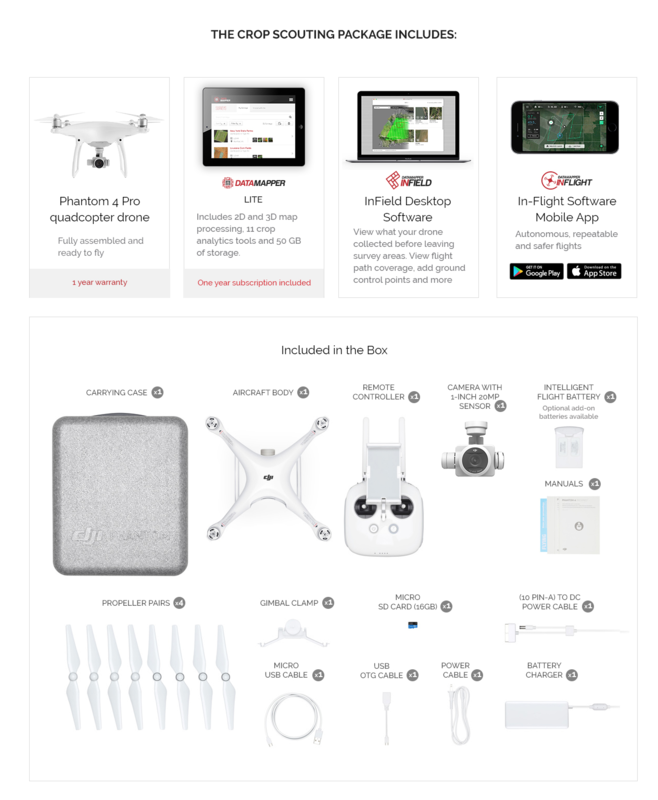 The Crop Scouting Package combines DJI’s Phantom 4 Pro and a one-year subscription to DataMapper, which includes 60 2D and 3D cloud based maps, access to Volumetrics, RGB vegetation indices, and other analysis tools, as well as its flight software app, DataMapper Inflight, that programs the drone to fly the desired area of interest automatically. The goal of the package is to give growers a way to perform rapid aerial processing and analysis for same day information delivery. Crop scouting is an integral part of a farmer’s workflow. Through visual inspection, scouting allows a grower to determine how specific areas of the field are developing and identify crop issues for timely management. This process historically involved walking through the field to collect data manually, but the advent of drone technology is helping to make the process faster and more efficient. The Phantom 4 Pro’s advanced visual camera collects high resolution imagery at 20 megapixels, capturing the geo-referenced images that allow for automatic post-processing through DataMapper. The drone can cover about 150 acres with each flight. And with access to DataMapper Inflight, users can seamlessly fly the Phantom 4 Pro with the app’s intuitive flight planning and safety capabilities. Gathered data will then be uploaded to DataMapper where they rapidly processed into 2D and 3D maps and primed for further analysis. Farmers will also have access to DataMapper’s library of analysis algorithms that provide detailed information around major decisions a farmer makes throughout the season: measuring crop maturity, assessing plant health and creating prescription base layers that can be visualized in a farm management platform, like the John Deere Operations Center. The value of using precision farming tools to increase time and cost inputs on the farm is motivating growers around the world to take a closer look at how drone technology can fit into their existing workflows. By offering the Crop Scouting Package, PrecisionHawk aims to make seamless aerial information tools more accessible and appealing to first time users. As we move into the 2017 growing season, contact us to learn more about how the Crop Scouting package can work for your operation at: info@precisionhawk.com. And take a look at how the Smarter Farming Package by PrecisionHawk and DJI saved growers significant input costs during the 2016 season: Corn farmers save $10 an acre on nitrogen with the PrecisionHawk Smarter Farming Drone Package.